Our first stop was by the Grilled Cheese Grill on Alberta and 11th. Great place for kids with the bus and grilled cheese sandwiches. These guys do some crazy twists on grilled cheeses, both sweet and savory. From there we wandered down to Alberta and 15th. I really wanted to try Garden Monsters, (finally tried it) because I had been reading about his amazing salads that are supposed to keep you full all day long. Unfortunately when we arrived he was trying to get power back after being hit by vandals. 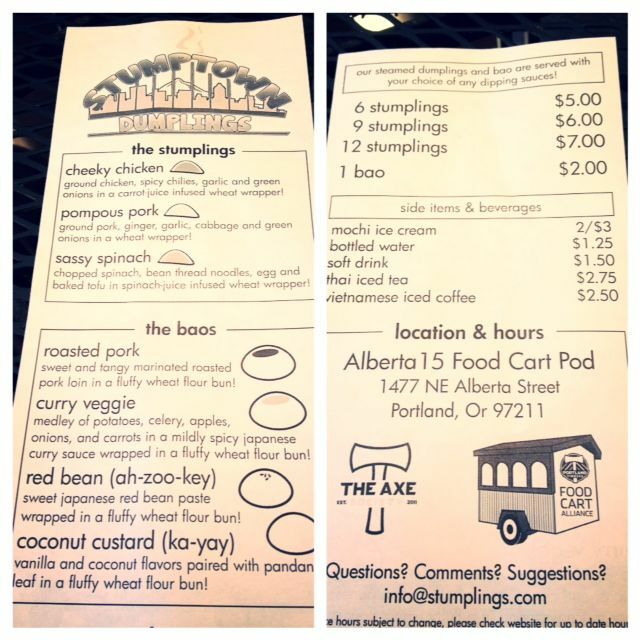 There were 4 carts total at this pod, so I assured him I would be back and we instead grabbed some Stumptown dumplings at Stumpling. It’s pretty easy to order at Stumplings. You pick what kind of dumpling you want and what kind of dipping sauce you would like to go with them. The guy said the vegetarian were the least popular, so we ordered 6 chicken and 6 pork for just $7. The dipping sauces we chose were Spicy Hoison, Soy Ponzu, and Creamy Peanut. The spicy was hot by itself, but as a dipping sauce it wasn’t too bad. I preferred the peanut sauce the best. We passed on the Thai Iced tea, but I’m sure it’s great, especially on a warm day. From there we kept going down to the Alberta and 23rd pod. I have been here quite a few times, but Portland Palate had not. I have a great love for The Cheese Plate. I wanted to get something small to eat here so we grabbed the Mushroom pate with house made chips. Such a treat! I washed it down with an IPA from Captured by Porches, who is also in that pod. My husband can’t come to this pod without ordering something from Kimmee at Retrolicious, They too had been vandalized when we were there and she was bouncing around with quite a positive attitude. 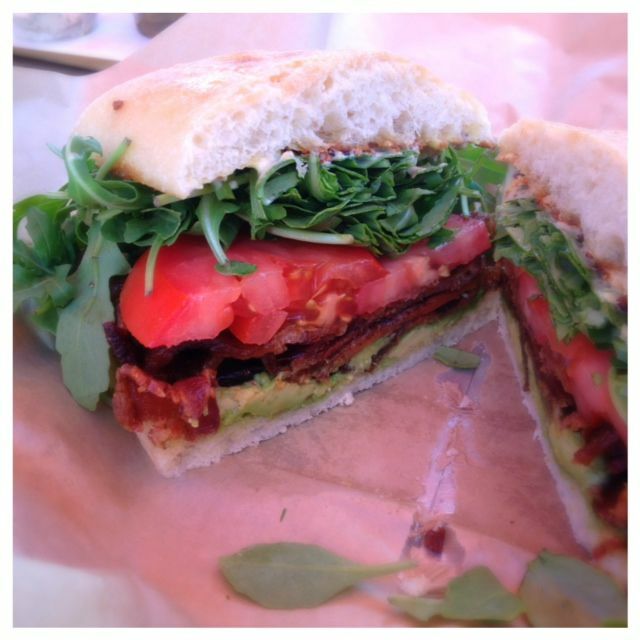 She couldn’t offer a lot, but she was offering a few cold sandwiches, so my husband got a Bacon, lettuce, tomato and avocado on ciabatta. I was also going to try Fiji Indian Curry, but he was vandalized so bad he wasn’t quite up and running. I saw that later that night he finally did get power. So even if you read this review weeks or months after this vandalism know that making an effort to support them is always appreciated and it’s a small way to say let the vandals know they can’t keep these carts down. All in all it was a great day. It’s always fun meeting other bloggers and talking food. I just love to talk food and eat food of course. We had such a great time I am sure we will meet up again some day. Great write up! We had so much FUN, we should do this again and invite more bloggers! OMG Stumplings sounds like the cart version of Steamers. (I eat at Steamers a lot on my lunchbreak). I have to go check it out! Well actually I need to check out ALL the carts on Alberta. Thanks for making me hungry! I LOVE the Portland food cart culture. Sometimes the best food comes out of there and it’s a fun environment. It’s especially cool that there are food carts with places to sit (like Cartlandia). 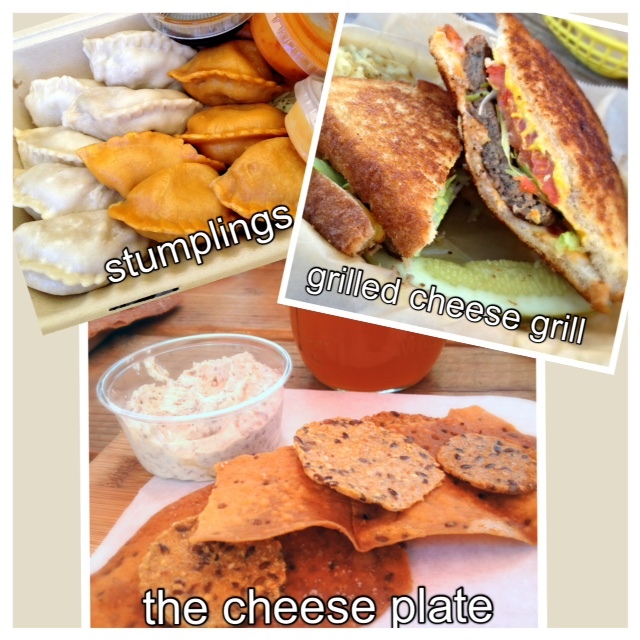 I tried the Grilled Cheese Grill and had the best sandwich–grilled cheese with jalapenos and cream cheese. Yum!